Phusion DNA Polymerase brings together a novel Pyrococcus-like enzyme with a processivity-enhancing domain and generates PCR products with accuracy and speed previously unattainable with a single enzyme, even on your most difficult templates. Additionally, Phusion DNA Polymerase is capable of amplifying long templates. In the quality control tests of Phusion DNA Polymerase, 7.5 kb genomic DNA and 20 kb λ DNA are routinely amplified. The unique structure and characteristics of Phusion DNA Polymerase make it a superior choice for cloning. 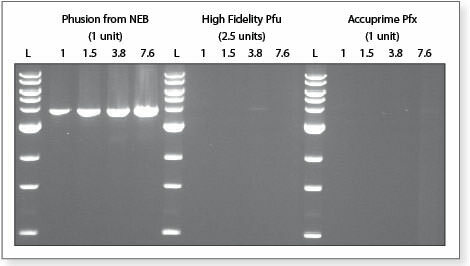 The Phusion High-Fidelity DNA Polymerase sets a new standard for PCR performance. 3.8 kb fragment was amplified from 50 ng of Jurkat gDNA using different polymerases. Reactions were carried out according to the manufacter’s recommended conditions (cycling conditions are shown below). Extension times are indicated (in minutes).. Ladder L is a 1 kb DNA Ladder #N3232. Determine your primers’ optimal annealing temperature. Nucleic acid-based aptamers for use with thermophilic DNA polymerases are licensed exclusively by New England Biolabs, Inc. from SomaLogic, Inc. (See Patent Nos. 5,475,096; 5,670,637; 5,696,249; 5,874,557; and 5,693,502). New England Biolabs, Inc. gives the Buyer/User a non-exclusive license to use the aptamer-based Phusion Hot Start Flex DNA Polymerase for RESEARCH PURPOSES ONLY. Commercial use of the aptamer-based Phusion Hot Start Flex DNA Polymerase requires a license from New England Biolabs, Inc. Please contact busdev@neb.com for more information.